Featured Image: Comics Tom Stade and Phil Nichol (front) and Director Alex Lass at our first day of rehearsals for a new play. I am in a play. 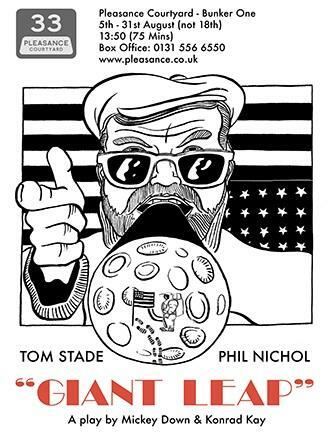 Well, I have been CAST in a play and begun rehearsals: Giant Leap at the Pleasance Theatre, Edinburgh. We will see if I survive. But the play is funny and I have a huge part – in every scene – and I will be brilliant. Okay, we will see! I hope the Pleasance folk don’t remember the paralyzed people who walked out of that story-telling show a few years back. I think they made an apology for my behaviour! “It is 1969 and the Americans are faking the moon landing. Someone needs to come up with the line that Neil Armstrong says in the sound stage in Hollywood. I am the failed old Jewish comic.” It’ll still be a stretch. BTB was amazing. Very very different from the past years’ walk as we went up the middle of Nunhead through beautiful Nunhead Cemetery. We stopped for a drink at six of Nunhead’s seven pubs. Richard Guard and Anna Crockatt and The Relatives sang at every stop and over 200 people walked at least some of the route. It was a lovely day from the Old Nun’s Head, through the Man of Kent to the Ivy House over to the Waverley Arms up to the Golden Anchor then onto the Hollydale Tavern to the Pyrotechnists Arms and ending at the Old Nun’s Head. It was supposed to last 90 minutes but went on for 270 minutes (3 1/2 hours) yet we didn’t lose many. See you next year with something new. I am asked about Bill Hicks,Sarah Silverman, and irony by The List in Scotland and about being an American working here in the UK. I told them I am not very American. It is readable so click here. For those keeping score, I have now sold £135 of tickets for my Edinburgh Festival showLewis Schaffer is Free until Famous, £5 at Just the Tonic Community Project. Buy ten tickets, like Indiegogo. Season over. You missed it. Who knows what I’m doing next year? I haven’t been keeping up with Nunhead American Radio shows. Take a punt and see if the new shows are up. Listen here on MixCloud. I am so busy. 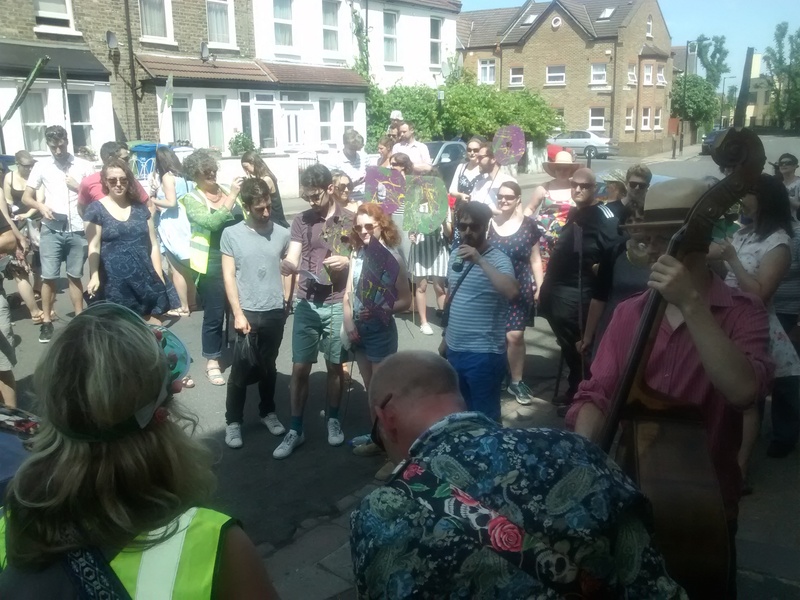 Wednesday we went en masse to the London Borough of Southwark council chambers to save the Southwark Woods, the acres of wilderness in Camberwell Old and New Cemeteries. Read the report. I heckled the council! It was brilliant as we presented clearly and coherently to the full council and the council had a mortician speak then voted along party lines to not ask the people of Southwark what they thought. Shocking display of parliamentary politics. So unAmerican. Look at the aerial video taken of the Southwark Woods. Click here to see the video (90 seconds). Be part of the campaign to save the Southwark Woods (sign the petition) so you get the emails. There are no more shows for me in London. You missed it. Listen to all the shows or most of the the recent shows, including Stewart Lee, Russell Howard and Robin Ince. Listen here on MixCloud. Our best shows, ever! And go to Lewis Schaffer YouTube Channel. Click for songs and such not MixCloud. The next gigs are 23rd July Exmouth; 24 July Guildford; and July 25th Barnsley. Go to the Tour 2015 webpage. Come see me.